These classic stuffed mushrooms are a total crowd pleaser! Serve them up as a quick and easy party appetizer or as a vegetarian side dish for the holidays. You'll also want about 1 cup of chopped mushrooms for the stuffing. For me snagging 4 extra-large mushrooms from the bunch did the trick. I also tend to grab the broken mushrooms of the bunch to chop up for the filling. Remove the mushroom stems from your mushrooms. Finely mince and set aside. Next toss your butter onto a non-stick frying pan and adjust to medium heat. Next add your breadcrumbs, coating them in oily buttery goodness, then toss in the minced mushroom stems and garlic powder. I like to mush the ingredients down, flip, and repeat (not quite like a pancake… but if you have those skills – well, then you’re pretty awesome!) Mushing the stuffing will coat every inch evenly with olive oil/butter. Overly dry stuffing will burn, so add a little extra butter or oil as needed. Sometimes I'm good with 4 TBSP of butter and other times I'll add a few extra tablespoons to moisten the mixture. Now start tasting! This is where you get to do your own personal magic and season away til your tastebuds are happy. Start with just a tiny sprinkle of salt, pepper, garlic powder and any other Italian seasonings you have on hand. Taste again, repeat, and all that jazz. I use a LOT of garlic powder and really love a little extra oregano + parsley. Ready to stuff 'em? Let your stuffing cool down a bit, line a thin cookie sheet with foil, and grease the foil lightly with olive oil (a tiny dab will go a long way!). Line up your mushrooms 1inch apart and stuff! If you prefer your stuffing to be really crunchy, you can pack it in a towering mound a top the mushroom. Most of my friends/family prefer softer stuffing, which means when you stuff the mushroom, push it as far down into the mushroom as you can, and keep it level with the top of the shroom. Bake at 350 degrees F until the mushrooms turn golden brown, about 20 minutes. For extra soft mushrooms, feel free to bake an additional 10 min. Commence faceplant. Though I use panko in my crab stuffed mushroom recipe, I wouldn't use panko here. 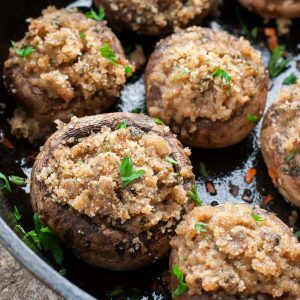 Regular Italian-seasoned breadcrumbs work oh-so well in this classic stuffed mushroom recipe and I couldn't imagine them any other way! Crazy for cheese? Grated Parmesan cheese makes a tasty addition to the filling if you'd like!